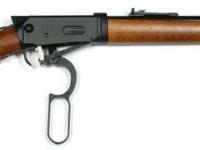 The airgun version of the Winchester 1894 firearm! 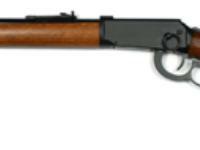 Walther's Lever Action rifle is so realistic, no one will be able to tell the difference between the airgun and the firearm! Things I liked: Everything about this rifle is great, workmanship, balance, accuracy. 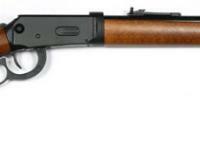 Things I liked: I'm biased but I really love this lever action rifle ( I grew up watching westerns on Tv and loved this type of rifle). It is very solid, fast, easy to use, has beautiful workmanship and balance and for someone who isn't particularly experienced at shooting air rifles, pretty accurate. If i were a better shooter this rifle would be too. Things I would have changed: Make the front and rear sights out of metal--the rest of the rifle is, as far as I can tell. What others should know: If you like lever action rifles, do yourself a favor and buy this rifle. You'll never regret it. You'll get tons of enjoyment out of it and just love holding it and looking at it. It really makes me smile. Money very well spent. Things I liked: Aesthetics good. Very little plastic. Decent wood. No hitches in the action. Advertised fps is 633. Distributor chrony says the best was 597 on mine, but it's only halfway through the breakin period. I'll test it myself after 125 more rds. Accuracy is better than advertised. Using an old retro fitted Ransom Rest with a zero positive lockdown, the rifle fired consistent one hole groups of .257 to .312 inches at 20 yards. That's right,...20 yards. 60 feet. 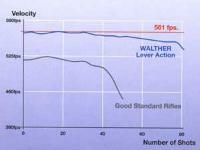 Offhand or off of a rest, the rifle is so accurate it's almost boring to shoot. I'm down to using pennies as targets. Paper is simply no challenge. As with all good guns, ammo is the key. I'm still working on that. Look for snug fit on these cylinders. They are precise and much of the generic common ammo is not. While I have had no jams with any, accuracy is deffinately affected. My first two choices so far are Beeman hollow pts. and Daisy Avantis. Snug fit. I have other ammo to try and some I have already ruled out. If you're an "old west" fan this is the gun for you. 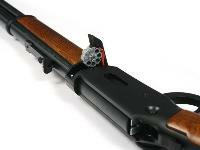 Nice lines, matt receiver, blued barrel, smooth action. I'll probably buy the scope mount and a scope for it although I don't know why. It surely isn't needed for accuracy and it would spoil the "old west" looks of the gun. Buy extra cylinders. Makes for more shootin' time. You'll need at least 8. 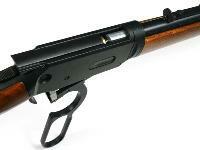 This is a very nice airgun. Another fine job from Umarex. Things I would have changed: The buttplate. It's plastic and ill fitting to the stock. 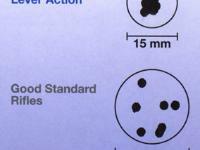 It's also the co2 charging port so I can understand some of it. It's really not a big deal but it could have been better designed. What others should know: Be prepared to shoot. A lot. 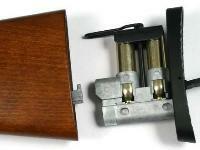 This gun holds 2 co2 cartridges and Umarex says not to store the gun without discharging the cylinders. I don't know what the shooting capacity of the co2 is. I dump mine after 64 rounds and there is still plenty of life left in them. That's just me. No drop off from round 1 to round 64 at 60 feet...I do know that. All I'm say I guess is that this isn't your "get in 10 rounds before dinner" gun. When you charge it...be ready to shoot for a long time. It's a fine reproduction and it's deadly accurate.